Please buy direct from RC Systems Inc.
TDS2020 and TDS9092 are obsolete embedded instrumentation computers based on the language Forth. Production ceased September 2008 following an announcement over three years earlier in May 2005. Technical manuals and downloads for TDS2020 and TDS9092 remain on-line. 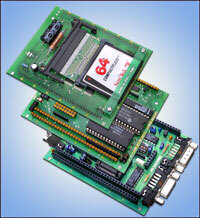 Although TDS2020 and TDS9092 are no longer generally available, you can buy most spare parts and accessories from us. We also offer a repair service. All remaining computer boards, spare parts and accessories are available for sale.